MIDDLEBURY – As confident as Northridge swim coach Kyle Hembree is, even he paused for a moment and recognized what an accomplishment his team pulled Saturday. The Lady Raiders swept the Northern Lakes Conference Girls Swimming Championship meet, taking all 12 titles in a blitzkrieg that included a handful of meet records and the official howdy-do of the newest superstar in the Raider theatre. Hembree, in his first year as head coach for Northridge, was an assistant for Joe Keller, who brought the program to prominence for almost two decades of dominance. Hembree himself was a swimmer at Northridge and spent much of his time Saturday urging his lanes forward much in the same manner Keller did. Rolled up heat sheets in hand, mumbling about tenths of a second pro or con at the end of each race. Among the many star-studded performances from Ridge was the emergence of freshman Elsa Fretz, who has been very good all season but took that next step and made Saturday look like her personal highlight reel. Fretz smoked the field in the 200 free at 1:50.92, missing a meet record by .17, then smashed the meet record in the 100 at 50.35. What was just as interesting was her split in the 200 free relay, where she opened the event with a 23.62 split, helping the Raiders establish new meet and pool records at 1:37.10. Fretz also helped the 400 relay to a meet record at 3:32.75. Ridge’s medley relay opened with a meet record of 1:48.50 and Sara Troyer was outstanding in diving, stacking up a 531.65 to clobber her own meet and pool records. 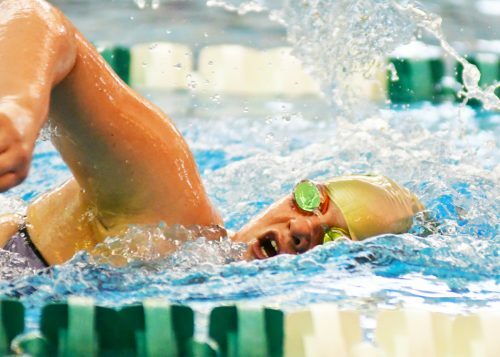 Sydnee Emerson and Lauren Miller also won two events, Emerson the individual medley and butterfly, and Miller the 50 and backstroke. Caitlin Clark took the 500 free and Jenna Nethercutt won the breaststroke, which wound up being the most contested race of the day. Nethercutt wasn’t in the lead for much of the race. 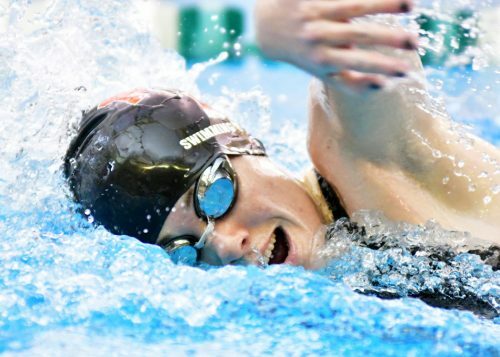 In fact, she was trailing heading into the final 25 yards of the breaststroke. Warsaw’s Delaney Wihebrink held that lead, and had it for much of the first 75 yards. As the two, along with Ridge’s Haley Dygert, emerged from the final turn, it was Nethercutt who had a slight lead over Dygert, with Wihebrink desperately trying to reclaim her edge. Nethercutt was able to hold on for a 1:07.50 win, with Dygert sliding in .20 later and Wihebrink at 1:07.86 and visibly peeved at her ‘3’ on the board. Warsaw had two other top threes on the day, coming from its medley relay of Wihebrink, Lauren Kuhl, Taylor Gunter and Olivia Herman at 1:54.12 and Wihebrink, Herman, Gunter and Laurel Moeller at 1:44.85. 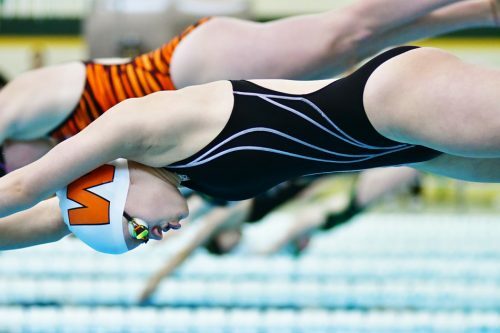 The Tiger 400 free relay was fourth and had four consolation wins, two from Mady Ray in the fly and breast, Morgan Bruner in the 50 and Kuhl in the 500. 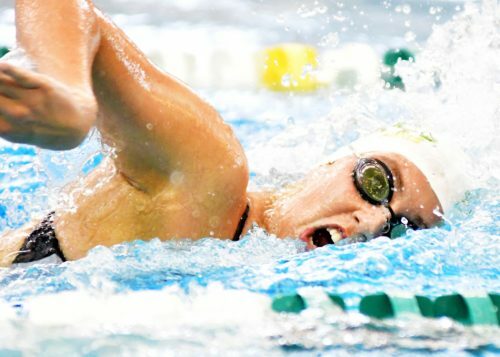 In the same breaststroke final, Wawasee’s Rileigh Atwood took fourth and nearly clipped her own school record, finishing at 1:09.78. Atwood set the record in December with a 1:09.30. 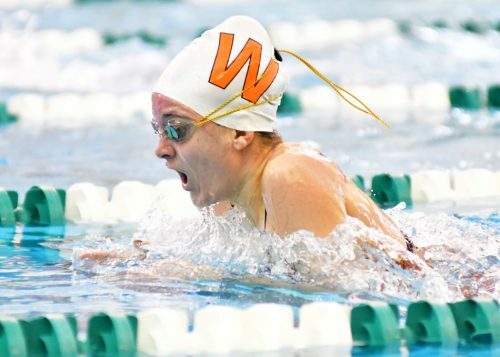 The Lady Warriors only had one other swimmer in a championship final, with Ella Park taking fourth in the 500 at 5:26.35. It’s 400 relay was third, 200 relay fourth and medley relay sixth. Wawasee had Park win the 200 consoles, Atwood the 100 consoles, and Alyssa Koch take console wins in the IM and backstroke. NorthWood’s top showing came from Kate Jarvis, who was fifth in both her 100 and 200 free showings. Jarvis opened with a 2:04.24 in the 200, then came back in the 100 and inched closer to her personal goal of a school record with her 56.30, still chasing the 55-low on the board in Nappanee. Panther diver Laura Schrock took fourth. Northridge won the team title with a whopping 574 points, Concord second at 452 and Warsaw third at 309. Rounding out the standings were Wawasee (223), Goshen (183), NorthWood (145), Plymouth (133) and Elkhart Memorial (73).